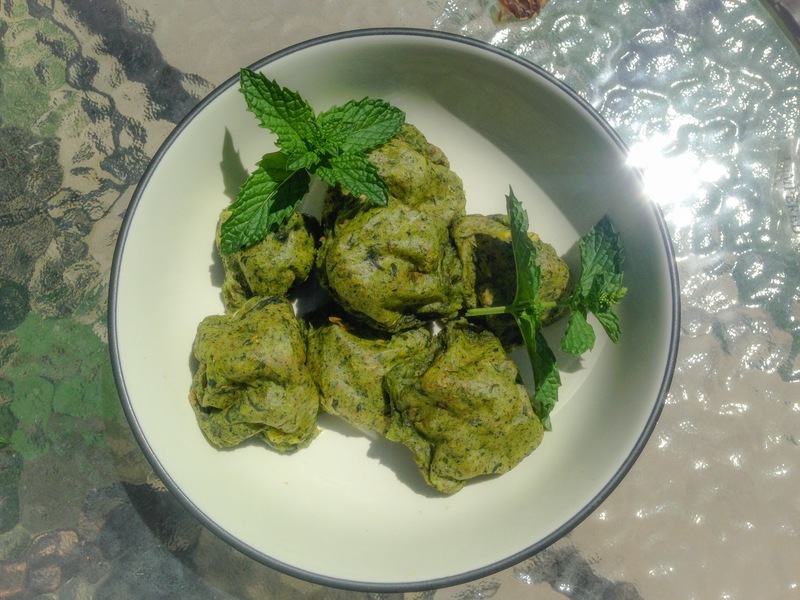 I have been making these Spinach Balls for snacks here and there and the other day I made a whole bunch of them and after eating like 20! I realized this is a meal on its own!!! and it is so healthy and so good for you!!! **Note: Spinach is a super food loaded with tons of nutrients in a low calorie package. Dark leafy greens like spinach are important for skin and hair, bone health, and provide protein, iron, vitamins and minerals. Cut and Peal your Potatoes into big chunks and boil until soft ( not too soft) Boil for 8 minutes. Chop all the herbs, You can also use dry Herbs if you don’t have fresh ones. Pour everything in a Bowl ( without the water) and mash it all together. Add the Nutritional Yeas, the other Herbst and Lemon Juice to the mix and mix it all together. When everything cools down and its safe to touch, take a chunk and Roll it into a ball with the Palm of your hands. they should be on the smaller side, but not too small. get your baking trey and put some none stick baking paper on there. Bake for 15-20 minutes at 450 degrees ( depending on how crispy you like it)and there you have it!!! let the balls cool down a bit before you dig in 🙂 mine are still a little soft in the picture cause I was in a hurry but these get hard and crispy on the outside and creamy on the inside! Thank you so much for reading and as always YOU”RE WELCOME! please follow me for more recipes and vegan goodness. Next The Dragon’s Loyalty Award! OHHHHH MYYYYYYYY EYES!!!!! THIS IS SO EASY. I AM GOING TO TRY IT WITH SWEET P AND SEE HOW IT COMES OUT. GRATEFUL FOR YOU BELOVED! Awesome!! I think with sweet potato you might need to add oil because it will be too mushy?”! Yum thanks for the recipe!! This recipe seems so delicious! Do you think it would work to make them into patties like for a veggie burger? I found this amazing recipe and I tried it. Well, I didn’t quite follow the recipe so my version is just not publishable but it taste yummy! Follow the recipe! Always follow the recipe! Enjoy! Sounds SO awesome – will definitely try them! I made these flat instead of round and it was a good idea…baked up more firmly. I added hemp seeds for some extra protein and used the food processor to get all the ingredients mixed well before baking. Instead of adding lemon juice to the mix (I preferred the texture without it), I instead made an aioli using it, mayo, defrosted basic and garlic cubes (from Trader Joe’s…handy to keep in the freezer), and a bit of salt and pepper. The cold aioli on the hot potatoes (I used half Yukon gold and half sweet potatoes) was fantastic! Thank you for the recipes…easy and tasty!